The covering on your roof performs two functions. 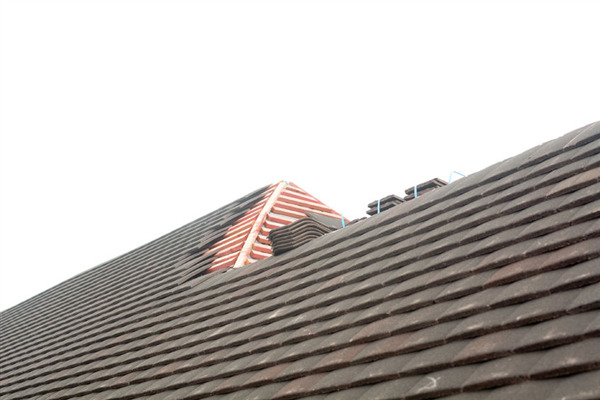 First, it is there to give your roof an added layer of protection. Second, the covering adds style and design to the home. Every type of roof covering has its own benefits and features. Among the most popular coverings are asphalt shingles, metal, tile, and wood materials. The underlayment is a black thin paper that rests on top of the decking to protect it from water or air intrusion and other outside elements. We recommend installing an additional waterproofing membrane or vapor barrier alongside the underlayment. Doing this gives the underlayment triple resistance and helps ensure a long-lasting roof. Flashing protects the roof’s valleys and hips, where water intrusion is most likely to occur. Flashing is constructed from rust-proof steel. It is designed to tolerate outside weather and provide the highest level of protection from water runoff. If the metal flashing is worn out or damaged, we need to replace it right away. Ventilation is essential for reducing the amount of humidity and condensation that build up in your home’s attic. It is vital to have an ongoing stream of air that flows from one side of the attic to the other. We install different types of vents depending on your home’s roof design. One of the most common types of ventilation is ridgeline, where we install a single vent along the topmost ridge of the roof. The type of insulation that you use for your roof can be the difference between a highly effective roof and an inefficient one. If you choose to insulate your roof, you have a choice between radiant barriers and traditional insulation. Radiant barriers are made of a highly reflective material, usually aluminum, that reflect radiant heat which keeps the entire home cool. A small layer of modern radiant barrier can replace the need for several feet of thick insulation. If you are looking for a professional roofing company in Minneapolis or St. Paul, Minnesota, then contact Intelligent Design. We help homeowners remodel their kitchen, bathroom, attic, or basement. We can also help you. Call us today at 763-315-0745, or you can message us on our contact page.